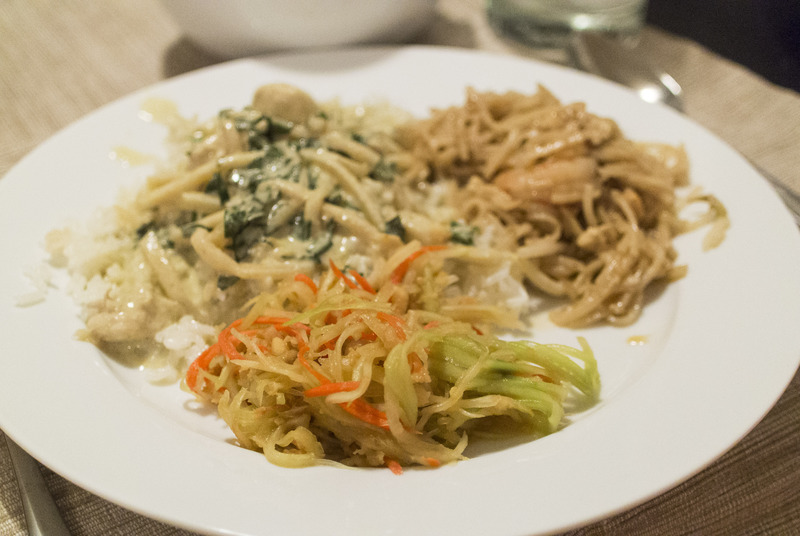 Our friends’ desire to learn how to make Thai green curry led to an impromptu Thai night, where D and I decided to get a bit ambitious and make two new Thai dishes we’d never made (in addition to the curry). Pad Thai was a particularly daunting prospect, as most of us have had our fair share of Pad Thai over the years and have developed a strong idea of what it should taste/look like. Chicken soup with coconut milk (known as Tom Kha Gai ต้มข่าไก่) was something I discovered on our recent trip to Thailand and really enjoyed, so I was keen to try it. In a small bowl, soak the tamarind in ½ cup warm water. Squeeze out the tamarind and drain it. To a small saucepan, combine tamarind, brown sugar and fish sauce. Adjust the amounts to your taste. The sauce should have good flavour but be strong in taste. Set aside. In large frying pan, heat ¼ cup oil over medium-high heat. Sauté garlic and pickled radish for 1 minute. Then add in tofu, ground chili and eventually prawns. Season with salt and pepper. Sauté until prawns are cooked. Remove mixture from the pan and set aside. Heat ½ cup oil in the frying pan over medium-high heat. Add in noodles and sauté briefly, before stirring in the reserved sauce, a little at a time, to soften the noodles (add more oil if it doesn’t look oily enough). Stir in garlic-shrimp mixture. Crack 2 eggs over the noodles and stir well. Stir in bean sprouts and peanuts. A few notes on preparation: Bear in mind, the above ingredient list amounts are very approximate (particularly for the sauce). Thai cooking definitely abides by the motto of “just put some stuff together until it tastes good”. Once you get all the bits figured out, it turns out to be relatively straightforward to make. D noted that it could definitely be sweeter, so increasing the sugar in the sauce would help. All in all, I think we very much enjoyed the flavour of the Pad Thai, though we noted it would definitely be something to continue re-visiting and refining. Put coconut milk and water into a medium-sized pot and bring to a boil. Reduce heat, add the galangal, lemon grass and kaffir lime leaves and cook for a few more minutes, stirring occasionally. Next, add the chicken, salt, fish sauce, sugar and lime juice. Cook until the chicken is done. Then, add the mushrooms and remove from heat. Garnish with cilantro. To serve, put 1 tbsp of chili paste in the bottom of a large serving bowl and pour in the boiling soup. A few notes on preparation: I forgot to garnish with cilantro and stir in the chili paste. I couldn’t get fresh galangal, but I did find frozen galangal, which I thawed then sliced. I was really pleased with how the soup turned out. I was excited that it smelled exactly like the soup that I had in Thailand, which was encouraging. The soup had a great sour flavour, which doesn’t appealing but is very compelling, and it was offset nicely by the rich flavour of the coconut milk. Definitely a success! Very quick and easy to put together and a delicious pay-off!